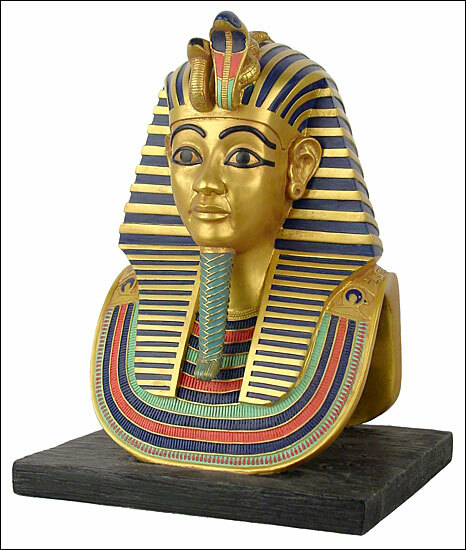 Mask of King Tut, Mask of King Tutankhamun, Tut's mask, funerary mask, tutankhamun, king tutankhamun, king tut. Egyptian Museum, Cairo Dynasty XVIII, 1347-1237 B.C. This marvelous mask of excellent workmanship protected the head of the mummy of Tutankhamun. Further protection was assured by a magic formula engraved on the shoulders and the back of the mask. The usual Nemes headdress knotted back at the nape of the neck, is a striped blue-green imitating lapis lazuli. The Uraeus and vulture head in gold inlaid with semi-precious stones and colored glass, ornaments the brow. The mask�s eyes are made of obsidian and quartz with a touch of red at the corners: the cosmetic lines and the lids are of inlaid blue glass. The divine beard, plaited and turned up at the end, is of cloisonn� work (colored glass held in a framework of gold.) The wide necklace collar is formed of rows of lapis lazuli, quartz, amazonite and colored glass beads attached at each shoulder to a gold falcon�s head ornamented with obsidian. This mask presents us with a beautiful albeit idealized portrait of the young King.